What I have been up to... here's a coupon! I can't believe I haven't posted anything in so long! I have a good excuse - I've been busy beading more donations for some great dog rescue groups. This time I am concentrating on Pit Bull and Bully rescue groups. 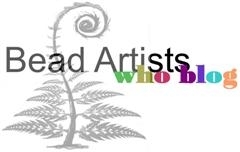 I have also opened a second shop at Artfire exclusively for my bead patterns. Over the weekend I finished transferring the patterns from 3PeepsDesigns to 3PeepsDesignsToo. In celebration of this second shop opening, I want to offer the readers of my blog a coupon to use in my shop - its good for 25% off of the total, good for 1 use, and expires on Dec 20, 2010. Here is the code: 6A6B659D0E-0A2B0438B2 I hope to see you soon! And now for some eye candy... This first picture is of my Little Bully Cuff in Turquoise. It went to Pinups for Pitbulls in Pennsylvania for their silent auction to be held on Oct. 23. I also sent to Pinups for Pitbulls this little gem. 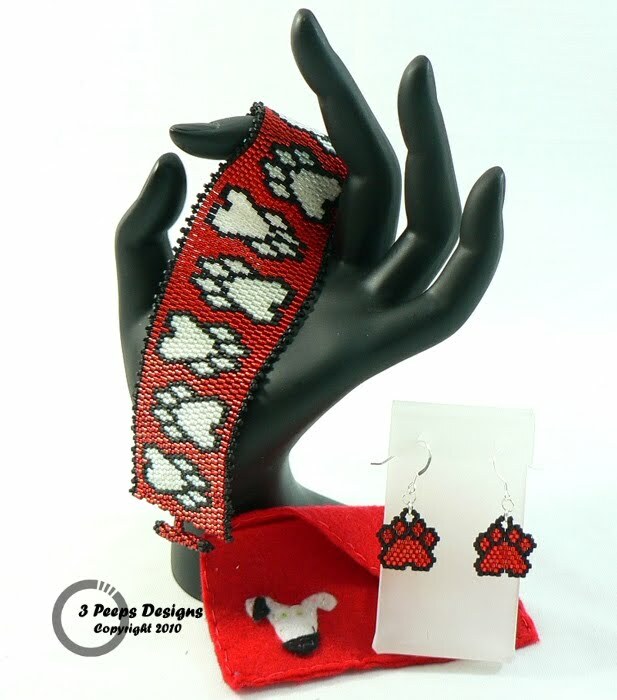 It features my beaded paw prints on suede and edged with more beads. I liked this so much I added one on leather to my shop, 3PeepsDesigns, and it is ready to ship right now! Next, I created a new pattern (and listed it in my shop) and the beaded cuff is going to Love-a-bull.org in Texas. Their silent auction is Nov. 7th. I am also including my Little Bully Cuff in purple for Love-a-bull.org. And I have just volunteered another cuff, this time to Carolina Care Bullies and I'm doing it in red with matching paw print earrings. The felt envelopes you see in the pictures were made by my 11 year old daughter. I have hired her to make them exclusively for the paw print earrings that you can find in my shop. I am not a fan of pit bulls but I know whatever you give your time to is good. By the way, great dog items. Congrats on new etsy site. Carol - before I met a pit bull I wasn't much a of "fan" either. I admit it was because I believed the media hype. Then I met one. And then I did my research and met some more. That was one of the best things I ever did... it was not only eye opening, but I found out that I have a lot more room in my heart than I ever knew. And whenever I need some unconditional love and big sloppy kisses all I have to do is find a pit bull. Thanks for the congrats on my new shop.... its on Artfire, by the way. If you have been to the site yet, you should check it out. Its a handmade wonderland. I think that's always true that we are often driven by the media, and they are not really true form of news anymore. I was on Artfire for about a year. But couldn't make my product sell there. I had to choose between the etsy site and artfire. I chose etsy because they have been good to me.